Of all the biscuit cakes I ever made this one is by far and away the favourite and it is 'suitable' for adults and children alike! Line an eight inch/23cm square cake tin with a double layer of cling film or parchment paper. Place the butter, chocolate and golden syrup into a large bowl and place over a saucepan of simmering water. When the chocolate mixture has thoroughly melted, add in the biscuits, malteasers, cherries and mix well. 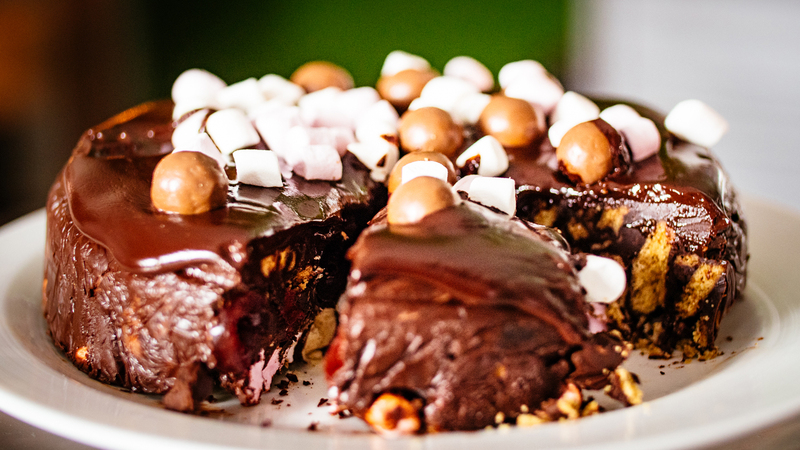 Pour the chocolate and biscuit mixture into the lined cake tin and stick the mini marshmallows into the top in a haphazard fashion. Transfer to the fridge and allow to set. When set prepare the ganache. In a saucepan, bring cream to the boil. Remove from the heat and add the leftover 100g dark chocolate. Stir until smooth and pour over biscuit cake. Decorate with more marshmallows and let set for two hours more if you can. Cut into small portions and enjoy within a week! It was a good recipe and I really liked the taste of it. I've made a gluten free version of this a couple of times for family birthday cakes, using Gluten Free Biscuits (minus the malteasers) and everyone has commented on how more-ish it was, they didn't even know it was gluten free!! The recipe couldn't have been any easier to follow or tastier!! I bought the Rocky Road with maltesers and chocolate fingers. it looked great and weighed a ton. i didn't know at the time of buying it that it was rocky road. I brought it to work for a birthday treat for one of our staff. It was gorgeous! even the dieters said it was 'worth sinning for'. Highly recommend it. Made this mix twice this eve and both times the initial melting went fine but then started to go all goopy and squigy. The proportions and quantities and quality of ingredients were exact both times. What a waste. Can anyone tell me why this happened and how to avoid it again? This is my favourite of the chocolate biscuit cake recipes around but...if you are a real chocolate lover like me then reduce biscuits to about 200grams; if you are vegetarian then leave out marshmallows (beef Gelatine) and substitute honeycomb (try Crunchie) YUM! It's the best I have ever eaten, and im fussy. Thank you for this fab recipe! Was looking for recipe without raw eggs and condensed milk. Off to try it! Oh and thanks so much for tin conversion /portion sizes - fantastic help, cheers! Eating chocolate would be the best option here. Cooking chocolate is generally better for toppings. Does it matter if you use cooking chocolate or eating chocolate? It will be a deep cake but it will work, there is no need to double the recipe. If you use a little more butter it will be less crumbly and more milk chocolate rather than dark chocolate. When the chocolate is fully melted and removed from the heat, wait for approx 5 minutes for the chocolate to cool slightly then add the marshmallows and maltesers. The recipe should be more than enough for 15 Children, it is a sweet cake so don’t be over generous with the slices. The 8” tray is fine. We wouldn’t recommend reducing the butter or golden syrup, the recipe works for the quantities given. We would recommend using Apricot Jam, heated in a small pan and brushed over the cake, then add the fondant icing. Glycerine a few drops can make it easier to roll and a less dry fondant, pastry tools for a smooth finish but there's no magical answer, practice is the key. For 40 people make 2 by 9 - 10 inch, bearing in mind that small portions are better as it is very rich. How long in advance can I make this cake? Hi, I made this today as a trial for part of my Halloween cake, so I just used the quantities for 1 person to see how it would go &amp; used a 6" round tin. It tasted lovely although I think I'd probably use more milk chocolate than dark next time but that's just a personal preference. However the tray I am planning to use for my Halloween cake is 9" x 9", so I was wondering what quantities I should use for this? Would the quantities for 8-10 people be enough? What 'glue' would be best to use to stick fondant to the cake? What size of tin would you need to use for around forty people? And what would you use to give fondant a smooth finish. Please reply asap I have only few days to do this. Could you make this in a 2lb loaf tin? Would you need to double the receipe? Hi Gemma, The cake can be stored for a maximum of two weeks. It should be stored in an airtight container which can be placed in the fridge if necessary, but we would recommend storing it in a cool, dark environment. Hope that helps and hope your granddaughter loves it! Would like to make this cake for granddaughters party. How long will it keep in the fridge please or how do I store it? Hi there I'm making a 2 tier chocolate biscuit cake for my daughters birthday there will be 30 kids just wonder what amount of ingredients should I use. i'm a bit confused as what quantities of ingredients I need for a 12" round tine 4" high? Looking to make this for a wedding! Im looking at making this for the bottom tier of a wedding cake. How many times should i increase this receipe to fill a 14" x 3" round tin. I am thinking of using this recipe to make a chocolate biscuit Christmas pudding. Any idea on what size pudding bowl I should use ( I have a 3 pint one) and what quantities that would entail. Also will it be difficult to cut? Would white chocolate or icing work best over it? Hi, I want to make this cake using the measurements for 8 people but in a round tin, what size round tin should I use? This cake can be make up to one week in advance, however do not store in the fridge or in warm conditions. It needs to be stored in an airtight container in a cool dark place. Hi Jean, we would recommend a fondant icing (a ready-to-roll icing), but don't ice it too far in advance. It can be easily rolled to size and any leftovers can be cut into interesting designs/decorations. I have used this recipe several times at this stage. By default I tweaked the recipe slightly as I was short of biscuits! Instead I used equal quantities of rich tea, digestives and ginger biscuits. This worked an absolute treat. The ginger biscuits give the most divine 'minty' flavour! Thumbs up all round!!! Hi, What quantities of ingredients would I need for a 12" round tin? I am making this for the first tier of a wedding cake. I made this for my daughter's wedding cake , finished it off with buttercream icing and roll out fondant , was fab ,and got rave reviews from all the guests, had to hide a little bit for myself !! It def pays off to use good quality choc, I used more milk than dark and used dairymilk and green and blacks. I filled a 10 ins square cake tin by using the amounts for 11 people .Def will make again . Made this cake today it was delicious but I found it a bit hard to slice as it crumbled a bit. Want to make it as a tier of a wedding cake any ideas to stop it being so crumbly. Any tips on how to keep the marshmallows and maltesers from melting as much? If you change the number of people, (just above the ingredients, grey box with '4 people' in it), this will change the quantity of the ingredients. Changing it to 6 people should fill a 12" tin. Kevin recommends an 8" tin, which will serve more than 4 people and there will be cake leftover to enjoy again! Thanks for prompt reply. I think I will just have to experiment with ingredients to get mainly the height of the cake. It will be iced as well so will have to try it out few times. Could you send me quantities to feed 8 people and I can go from there. Hi Amelia, how many people is the cake for? The drop down for number of people only goes up to 8 so you may have to work out how much of everything you need with a calculator. Was a treat and I would recommend it even though I'm 11. This is a very rich cake. It's nice but the recipe for 4 people would serve more like 10. Made this cake today - was spot on. Yum yum! I made this once. It did come out right but was way too sweet even though i used one bar of milk and dark chocolate. Will a loaf tin do for four people measure ?? Want to make this as part of wedding cake 10 inch? Tried scrolling to no of people to serve but it won't scroll down. How much ingredients would i need? I recommend a 10” Cake, and ensure that the baking tin is covered with at least a double layer of parchment paper or clingfilm. Hope this helps. Hi, Kevin recommends using a 10" loose bottomed springform tin for bigger cakes. Tried two different recipes today and this was the definite winner. The measure of ingredients were spot on and it tastes gorgeous. First time to make biscuit cake and its really lovely, maybe its too nice! Yum yum! This is a brilliant recipe for all your chocolate biscuit needs! What size tin do you need for the bigger cakes?